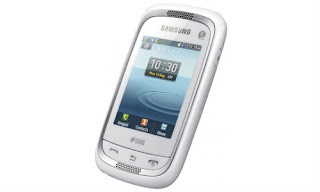 Samsung unveiled another low-end touchscreen feature phone – Samsung Champ Neo Duos (GT-C3262).It is an entry level feature phone from Samsung with a Stylus and also Dual SIM feature which becomes the main highlight of this gadget. Samsung Champ Neo Duos is not having the well known Android OS. The user interface is TouchWiz-Lite 2.0. Specs wise, this little gadget comes with a 2.4-inch QVGA screen, VGA camera, Bluetooth, 3.5mm headset jack, and a 1000mAh battery that’s good for up to 14 hours of talk time. The internal memory is 20MB. The microSD slot provided can provide expandable memory upto 32GB. It has got smart social communication features. Both the SIM’s are hot swappable. Samsung is mainly targeting young customers through this handset. It is also bundled with Facebook and Twitter applications. The preloaded ActiveSync application provides Push Mail support. It also has got built-in Opera Mini web browser. Samsung Champ Neo Duos has Bluetooth 3.0 and micro USB 2.0 connectivity too. A VGA camera is fitted the rear side. It lacks a front camera for video calling. It also has applications like Gtalk, MSN, Yahoo and ChatON applications. It is also provided with a separate stylus. The 1000mAh battery can provide a talktime of 14 hours and a standby of 550 hours. The Samsung Champ Neo Duos will cost Rs. 3,260, which is roughly $60. 0 Respones to "Samsung Champ Neo Duos (GT-C3262)"